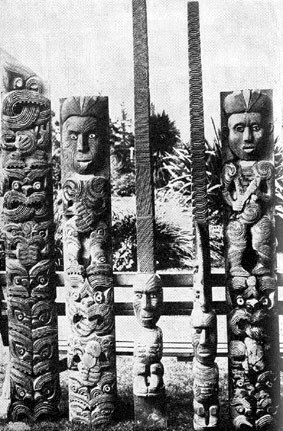 Carved Maori house posts display the complex art style that distinguishes the culture of New Zealand Polynesians. These posts, carved in realistic and highly stylized forms, represent ancestors and gods. They decorated the facades and interiors of Maori ceremonial houses.